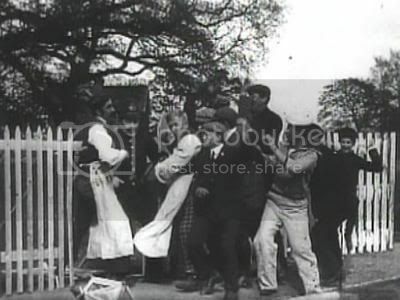 Produced by the Hepworth Manufacturing Company, a large early film producer making around 100 films a year, this comedy chase film directed by Lewin Fitzhamon, who directed most of the Hepworth Manufacturing Company's films from 1904 onwards is one of my favourites of early cinema. 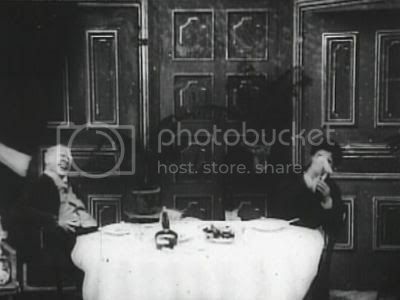 The film starts with an old man, possibly an uncle or grandad, playing a trick with a boy at the dinner table involving sneezing powder. The boy obviously wants to get his own back, shaking his fist in anger at the old man while the protagonist laughs. 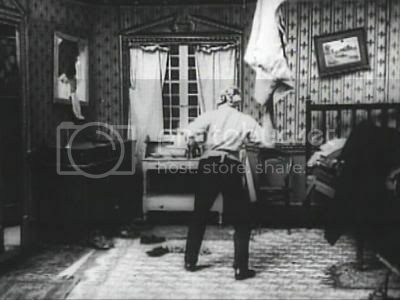 The scene cuts to the boy entering the old man's room while he sleeps, and sprinkles sneezing powder over many of his items - including his handkerchief. The next day, the old man wakes up and starts to dress - the sneezing powder takes effect quickly, with clothes flying in the air and paintings on the wall breaking, as well as the chest of drawers and bed. Still sneezing, the old man leaves the house with the boy following. 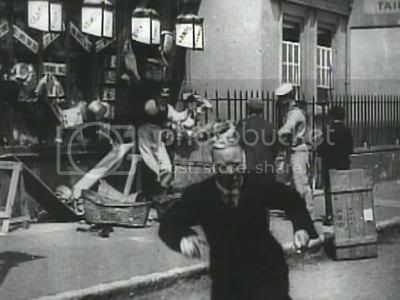 For a while the old man seems fine, until he stops outside a shop with items displayed outside, where the old man sneezes so hard that items fall onto the floor, and the chase starts, with the old man running away from the shopkeeper and passers-by, including a sailor. 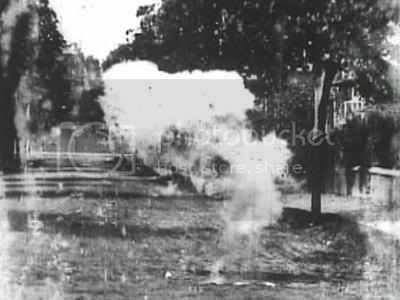 The chase continues with another shop display being destroyed (a shop called 'Hepwix', a sign of watermark that it's a Hepworth film) and then a Policeman being blown over, knocking down a fence on the way. 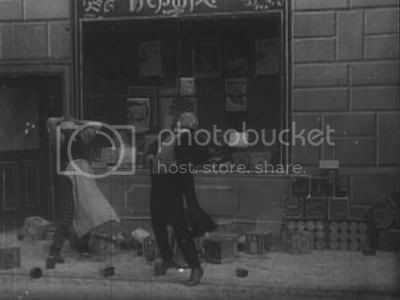 Stopping outside a house and trying to take refuse, he sneezes again, and after damaging the front of the house, when a woman comes out to argue with the old man, he sneezes so hard her hair (or a wig, i'm not sure what is being implied) blows off and the woman starts sobbing. The growing mob of passers-by and those affected by the sneezing old man's rampage continues to grow, and is joined by the now bald woman. The old man runs up a ladder to hide in an upper floor room of his house. 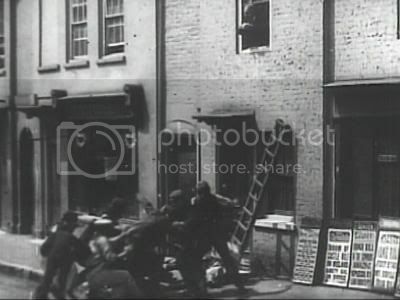 The bald woman and the Policeman climb up the ladder with the mob at the bottom of the ladder, wanting to take their anger out on him. 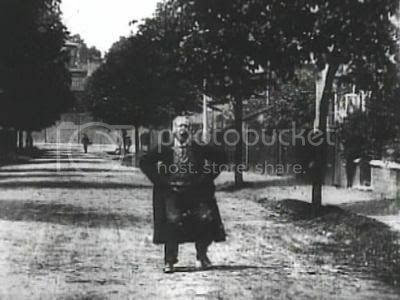 He pleads with them, and then sneezes again, blowing the ladder onto the ground with the bald woman and Policeman on it. The angry mob run away, apparently in fear, and the old man follows them but then escapes them, sneezing harder and harder as he does. 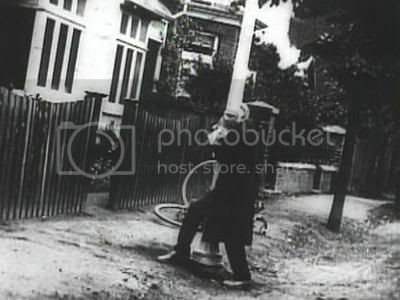 When he escapes the mob, he stops for breath and sneezes so hard the whole world tilts, and he has to hold onto a lamp post and a fence for safety. 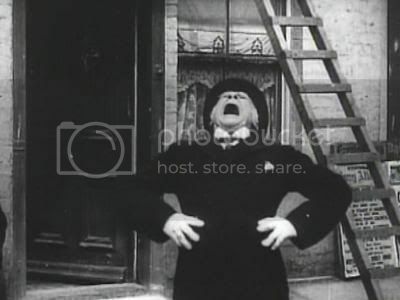 The old man walks down a road, and then in a dramatic climax, the old man prepares to sneeze, evidently for what will be a very large sneeze - then he sneezes so hard that he dissapears!